There's no oxymoron there. For many consumers, snacks have become the meal; for others, their diet plan promotes snacking as a means of weight control. Savory snacks, according to Mumbai-based consumer market research group Bharat Book Bureau (www.bharatbook.com), are a $75 billion global industry and poised to hit $85 billion next year. But they suffer a split personality. By definition, a snack is something to enjoy only on occasion. But call it grazing, and snacking becomes a diet tool. Unless you do that in front of a television and snacks become the main culprit in the obesity epidemic. Which is it? Well, all of those, so the challenge for processors is how to make snacks healthier without losing the attraction of crunching and munching that turns us especially toward savory snacks. "Food makers are seeking to satisfy consumer demands for healthier snacks; they are looking for lower sodium, sugar and fats and to increase functional ingredients that provide qualities such as heart-health benefits or digestive health benefits," says Laura Daly, marketing manager for Snacks & Cereals at Cargill (www.cargill.com), Minneapolis. But "looking for" and purchasing are not always the same thing. "Taste is always king," adds Daly. "When consumers were asked to list the most important attributes they consider when selecting the foods and beverages in a recent Natural Marketing Institute Health and Wellness Trends survey, taste was at the top — where it always is, above ‘health and nutrition' and being ‘natural.' "
Since consumers are only going to meet you halfway in your quest to make healthier snacks, creativity is a must. The product has to both be better, which means it has to carry a healthier profile, and it has to taste better in order to break the old paradigm that says healthy foods just don't measure up when it comes to taste. Something as simple as changing a cooking method can make a big difference in the most fundamental health/nutrition aspect: calories. But any such change has to be done right to maintain the organoleptic qualities of the original technique. "Baked fries have been tremendously popular, and our sales have reached an all-time high since they were introduced them," says Mary Schulman, co-founder of Snikiddy Inc. (www.snikiddy.com), Boulder, Colo. With a passion for children's health, Schulman and her daughter, Janet Owings, founded Snikiddy in 2006 to create a "crunchy and tasty alternative to the fat-laden french fries and potato chips that typically dominate kid's diets — and [which] make them thirsty for sugar-rich sodas, creating a one-punch of high calories and low nutrients." The company's baked fries are made with real potatoes and corn and are completely free of trans fats, corn syrup, hydrogenated oils and preservatives. They contain no cholesterol, have half the fat of standard potato chips and are gluten- and wheat-free, as well as low in sodium. Developed for kids and families, the baked fries are available in different flavors, including "Classic Ketchup," simple sea salt and barbecue. The company recently released new varieties that are dairy-free. "Snikiddy Baked Fries have also attracted a large following of consumers who are on strict gluten-free, low-calorie and low-sugar diets," adds Schulman. Another tactic for "healthying up" savory snacks involves the use of the up-trending seeds and ancient grains. By using higher-protein, denser grains and seeds, formulators get to play on the advantages of the resultant denseness that, when baked, translates to a hearty crunch. Quinoa, kamut, spelt and amaranth as well as flax seed have become grains of choice for healthy-chip and -cracker processors. One measure of this acceptance is the presence of the whole grain stamp that now can be found on more than 5,000 products, according to stamp creator Oldways (www.oldwayspt.org), Boston, a non-profit organization dedicated to promoting healthier eating patterns. An unusual outgrowth of this is the availability of whole-grain nutrition without whole-grain taste. Cargill has developed savory snack crisp clusters, featuring fibrous portions of the grain called the aleurone, a layer surrounding the endosperm, or the starchy part of the grain. Aleurone contains about 30 percent of the grain's proteins, including beneficial pigments such as anthocyanins. "Barliv Crisp and GrainWise Wheat Aleurone deliver a heart-healthy, fiber-rich snack [ingredient] that qualifies for a front-of-package claim," says Daly. One of the most ancient grains is a common one: oats. Not typically considered a savory candidate, Edinburgh, Scotland, cookie and biscuit maker Nairn's Oatcakes (www.nairns-oatcakes.com) recently began offering savory versions of its oat snacks, such as Herb & Pumpkin, on this side of the pond. San Diego-based Granola Flats (www.granolaflats.com) takes a standard concept of oat and nut base to create flat little squares in flavors savory, sweet and the growing trend of both. Plus, they're whole grain. Similarly, Chicago-based Simple Squares (www.simplesquares.com) offers the combo of savory and sweet in a crispy snack that's an "all natural nut and honey confection infused with vanilla and herbs" such as rosemary and sage. But they're without wheat, gluten, dairy, soy or refined sugars. "Because we use raw, unfired fare, the Squares' power-packed nutrients are never compromised," says Chief Square (owner) Kimberly Crupi-Dobbins. Corn chips, of course, are one of the leading savory snacks. But only recently did products start to really use them as a springboard for an unlimited variety of flavors. Food Should Taste Good (www.foodshouldtastegood.com) was founded by Pete Lescoe in 2006 with the goal of providing consumers a greater range of choices in all-natural corn tortilla chips, chips made with without trans fats, cholesterol, artificial ingredients or GMOs. Food Should Taste Good chips are available in such diverse flavors as Multigrain, Sweet Potato, Lime, Olive, Chocolate, Blue Corn and Jalapeño among others. All flavors are certified gluten free, kosher, low in sodium and high in fiber. Many varieties are certified vegan. They may not be a Superbowl party favorite yet, but, as the package says, Beanitos are corn-free, gluten-free, non-GMO and have protein, fiber and a low glycemic load. Similarly, flours from beans, peas and chick peas are finding a place in savory snacks manufacturing. With a profile high in protein, fiber, vitamins and minerals, beans and peas translate well to savory. "Pulse flours and pea fiber are not just for people who have celiac disease, gluten intolerance or a wheat allergy — everyone can benefit from these nutrient-dense flours," says Margaret Hughes, communications director for Best Cooking Pulses Inc. (www.bestcookingpulses.com), Portage la Prairie, Manitoba. She notes these ingredients easily can be added to traditional formulations to give them a nutritional boost. However, beans present their own sets of challenges when it comes to creating chips. "Our product exists because I was looking for a low glycemic index food and thought, why not beans?" says Dave Foreman, co-founder and president of Austin, Texas-based Bean Brand Foods (www.beanitos.com). Dave's Brother Doug had developed the Guiltless Gourmet brand of chips, so the know-how to produce healthy baked snacks was a given. "We couldn't just create them in the kitchen," says Foreman. So they partnered with a plant in Austin to work out the details of mass production of the unusual product. Going beyond the trans fat-free label, Beanitos provide a complete protein. "As it turns out, it's necessary to include brown rice in the dough formula to make the chip work, and that simultaneously provides the necessary amino acids to complement the beans," explains Foreman. The dough also contains a variety of "inclusions" to further enhance the quality of the finished product. These include "ancient" grains, herbs, or flax seed, which provides a source of omega-3 fatty acids. The final product is baked and quickly flash-fried to give a familiar crunch. Beanitos' other calling card is that they are certified non-GMO. And lets not forget roots. While veggie chips have been enjoying some success on the fringe, they still occupy a position on the "alternative" aisle. WaiLanas Gluten-Free Yogi Snacks (www.wailana.com) are trying to change that with yucca root chips designed to directly compete with potato chips. They offer a gluten-free, wheat-free and soy-free snack option with 40 percent less fat than a regular potato chip. Ingredients are non-GMO and contain no artificial colors, flavors or preservatives in fun flavors like Pizza, Herb & Garlic, Barbecue and French Onion. Israeli ingredient firm LycoRed recently developed Sante, a tomato concentrate with all of the umami flavor characteristics from the tomato, but without the tomato taste. Sante can be used to enhance the flavor and reduce the amount of salt added to a product. Although recognition of the actual science is finally beginning to catch up with the decades of misleading information about salt, demand for low-sodium formulations remains high, driving ingredient providers to come up with innovative solutions. "Depending on the salty snack, we find our product can reduce sodium by 25 to 50," says Thomas Yezzi, founder of Nu-Tek Products (www.nu-tekproducts.com), Minnetonka, Minn. Nu-Tek provides reduced sodium sea salt as an allergen-free, natural product that contains no artificial flavors and enhancers and can be used as a 1:1 replacement for regular salt in virtually any application. "Technical challenges include flavor, intensity, functionality and shelf-life," continues Yezzi. "The developer must find a satisfactory solution for his application. It's important to choose an ingredient that meets these criteria. We have definitely seen an increase in sample requests for salty snack applications. When a company such as Walmart announces goals to reduce sodium by 25 percent across all product lines, food processors do take notice." A highly innovative solution to reducing sodium is to think tomatoes. LycoRed (www.lycored.com) developed Sante, a patented, natural tomato concentrate with all of the umami flavor characteristics from the tomato, but without the tomato taste. Sante can be used to enhance the flavor and thereby reduce the amount of salt added to a product. "Whenever we try to develop clean-label/natural products with reduced sodium or without yeast extracts or MSG, the important part is rebalancing the flavor profile," says Sam Bernhardt, director of new food ingredients for LycoRed Group. Sante is available as a liquid or as a spray dried powder, both suitable for snack preparations. "Sodium is a functional ingredient to many foods; we realize this and work hard to ensure we have the right balance," says Joanne Ferrara, senior director of research & development for Spicetec Flavors & Seasonings (www.spicetec.com), a division of ConAgra Foods (www.conagrafoods.com), Omaha, Neb. Salt isn't the only seasoning in salty snacks. "Consumers are looking for regional taste versus the traditional mainstream," Ferrara continues. "For example, Italian cuisine has been popular for many years, yet the consumer is going one step further to taste individual cooking styles. Each region of Italy is a bit different, and they want to compare the nuances of each locale. Same for Peru, Korea, Vietnam, India and other countries with unique and exotic seasoning blends that spice up their food. They want variety, intensity and point of difference that can include savory with sweet and fruit combinations. Savory herbs like thyme and rosemary are extremely complementary with citrus — [especially] lemon and orange — and fruits [such as] pomegranate, raspberry and peach." Bran has the potential to pump up the nutritional value of any savory snack, and it can come in many different formats. A surprising new source of bran comes from Almond Bran, the trade name for bran derived from almond skins by Nut-trition, Inc (www.nut-trition.com), Hughson, Calif. While technically nuts do not contain bran, all plants reproduce by germination and must form an outer covering to protect the germ and nutritive parts of their grain or seed. According to Robert Miltner, marketing director for Nut-trition, "The outermost layer is the one that must withstand the most physical abuse so it is very rigid and composed of woody material and little else, like the chaff of wheat. Inside the outer layer of an almond the kernel is covered by another protective softer layer referred to as the skin. This is similar to the bran of wheat, rice or oats, serving the same function as the brown skin of an almond." Many of the benefits of almonds are in fact due to the polyphenolic compounds in the skin. Nut-trition developed a process to recover this skin from the almond blanching process and refine it into Almond Bran. Almond Bran is a multi-functional ingredient because it contains insoluble fiber, antioxidants, anti-inflammatory compounds and prebiotics. Almond Bran is gluten-free, kosher and made in accordance with current good manufacturing practice. In formulations, it can be used as a 1:1 replacement for wheat bran in baked recipes. The future of snacks is already here, and it's all in the ingredients. 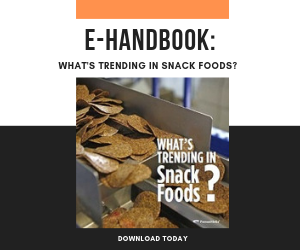 The more consumers begin to depend on snacks to be as healthy as non-indulgent foods, the more snacks will be evaluated by the same criteria. But processors have proven themselves to have that challenge in the bag. Innovative food and beverage products may well help individuals as well as companies' sales.